Cobots are one of the new things in robotics since I first built the learnaboutrobots site in 2003. Collaborative robots (cobots) can safely work in the same space as people. This grows the range of tasks within the automation universe and can make integration into existing factory space more predictable and less disruptive to existing manufacturing operations. Cobots are used in pick and place, injection molding, quality inspection, assembly, machine tending, gluing and dispensing, etc. 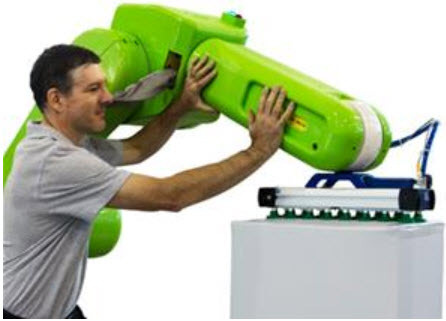 Traditional robots also perform tasks like these, it's just that cobots can do more of them. For example, a cobot and a person can work together ton an assembly tasks that would otherwise require two people and couldn't be done by traditional robots at all! I am currently working to deploy cobots and actively researching the application of AI, machine learning and deep learning to cobot programming. 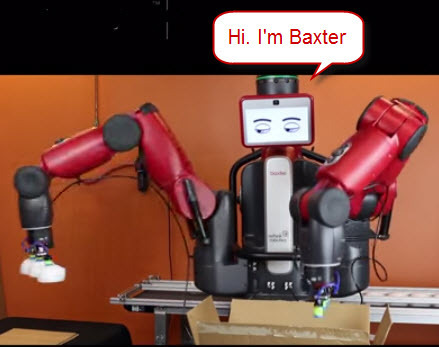 Baxter was one of the two original cobots. Rethink Robotics out of MIT designed, manufactured and sold Baxters. Baxter had some worthy goals, but sadly, Baxter was so bad mechanically that it was incapable of all but the most trivial tasks. The videos would show Baxter moving plastic cups from a conveyor belt to a box. A plastic cup was all Baxter could lift! I felt sorry for the thing. It shook so badly when it moved that people at trade shows laughed. When these crummy mechanicals were being designed, the computer scientists at Rethink thought their control algorithms would take care of the issues. This is an arrogant misconception among many engineers in the computing disciplines. Once crummy mechanicals have been built into a robot, that robot is doomed. 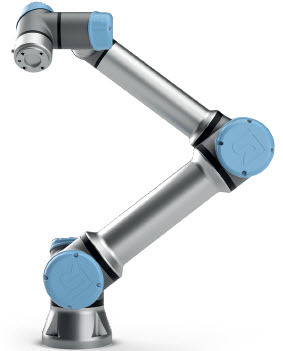 Universal robots is the second of the two original cobot companies. This is their UR5e cobot. It is very nice. The traditional robot manufacturers are now selling cobots. The ones from Fanuc are green. It goes nicely with the yellow of their standard robots. This figure demonstrates the fundamental difference between cobots and traditional industrial robots. The cobot is enabled and electricity is running through its motors, but a factory worker is inside the cobot's workspace and actually guiding the cobot by hand. This is not possible with traditional industrial robots.